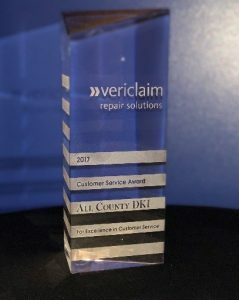 March 23, 2018 – All County DKI, a member company of DKI Services, North America’s largest disaster restoration contracting organization, announced they received the 2017 Excellence in Customer Service Award from Vericlaim Repair Solutions at the 2018 Insights Conference and Exposition in Grapevine, TX on March 21, 2018. The award recognizes the hard work All County DKI has provided throughout the year, their continuous dedication to outstanding job performance and maintaining effective communication between Vericlaim and the policyholder. All County DKI is one of over 500 contractors nationwide involved with Vericlaim, a managed repair network and claims management company. “This is an award that I personally have nothing to do with; it is dedicated to all the wonderful employees that work at this company,” said Dan Bulzacchelli, owner of All County DKI. All County DKI is a full-service property restoration company, specializing not only in water, fire and mold remediation, but also content restoration and reconstruction. Servicing the South Florida tri-county area, All County DKI offers rapid response to disaster restoration with a main focus on outstanding customer service. To learn more visit, www.allcountydki.com. A subsidiary of Sedgwick Claims Management Services, Inc., Vericlaim is a managed repair network and claims management company, committed to helping its clients manage and control their risk needs around the world.